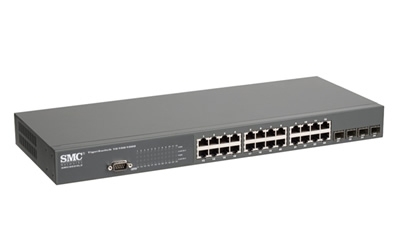 The SMC8024L2 is a feature-rich 10/100/1000BASE-T standalone managed switch designed to handle high bandwidth applications and capable of reaching up to 48Gbps with a non-blocking single chip switching architecture. It provides cost-effective, gigabit Ethernet switching for bandwidth-intensive networks that require easy to use management functions for optimizing configuration and performance. A flexible gigabit switch with 4 combo ports in a 1U high form factor, this switch is ideal for workgroup edge installations.